It’s summer and it’s hot, as in over a 100°F hot. 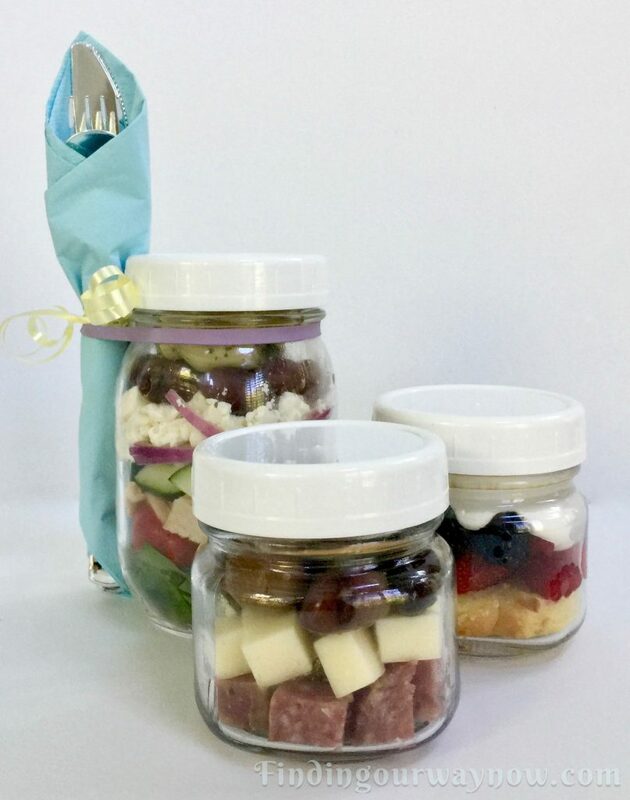 It’s certainly not the time to crank up the oven, stove or grill so why not pack a picnic in a few jars. The fact that we currently have company visiting for a week with a big interest in seeing the various wine regions that surround us; it just made sense to pack a basket for a few of the adventures we had in mind; thus the creation of a picnic in a few jars. 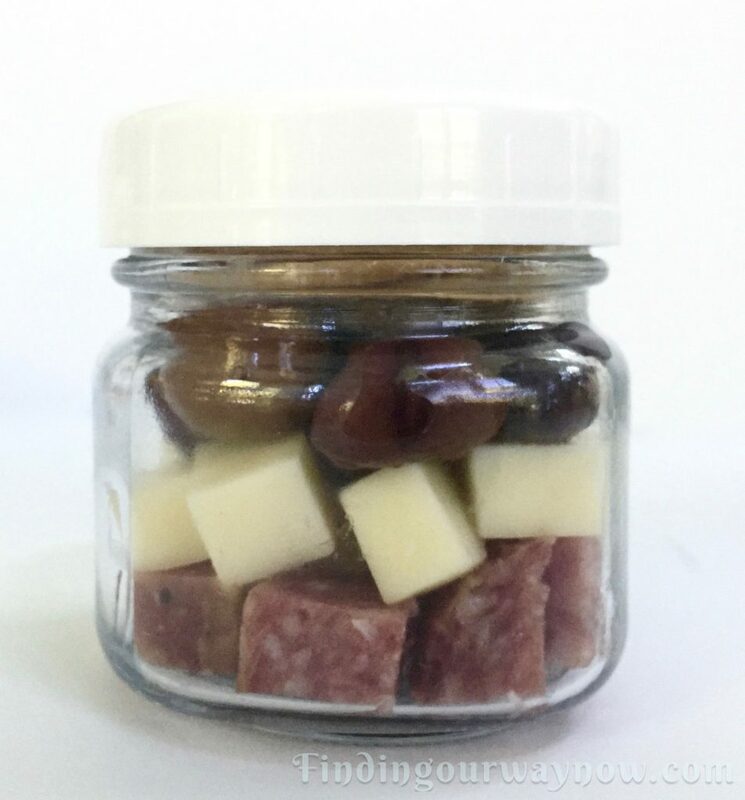 Using canning jars to pack individual servings for a picnic is super easy. The jars offer opportunities for endless variations. It also makes it easy to put together different flavor profiles to suit any individual. So for a bit of fun, here is one of the baskets I packed. Below you’ll find three recipes; an appetizer, an entree salad, and a dessert. Each recipe is designed for ease of assembly and for packing an elegant picnic that anyone would enjoy. Now, put on your apron and let’s begin. Add a single layer of cheese cubes on the bottom of the jar. Place a single layer of salami cubes on top of the cheese. Then add another single layer of olives. Tightly wrap 4 to 5 water crackers in plastic and place on top of the olives. If desired, place a few toothpicks on top for a quick serving tool. Tighten the lid and refrigerate until you’re ready to pack your picnic or to serve. Notes: This is a no-brainer; think one part cheese, one part meat, one part pickles or olives and finish with some crackers. Yum. Ingredients: Makes as many as supplies allow. Marinated Artichoke hearts cut into bite size pieces. Wrap a napkin around a set of plastic utensils and tie it with a ribbon. Repeat until you’ve created the number you need for your picnic. Start with a layer of baby spinach on the bottom of the jar. Tamp the spinach down a bit to create a bed for the next layer. Add a layer of grape tomatoes. Then add a layer of chicken. Continue with a layer of cucumbers and then all a layer of red onions. Sprinkle a layer of Feta cheese on top of the red onion. Now add a layer of Kalamata olives. Add a final layer of artichoke pieces. Top the artichoke pieces with a few spinach leaves, and then place a small disposable plastic container filled with the lemon vinaigrette on top. Tighten the lid. Secure a rubber band around the jar and tuck the napkin-wrapped utensil under it to hold it next to the jar. 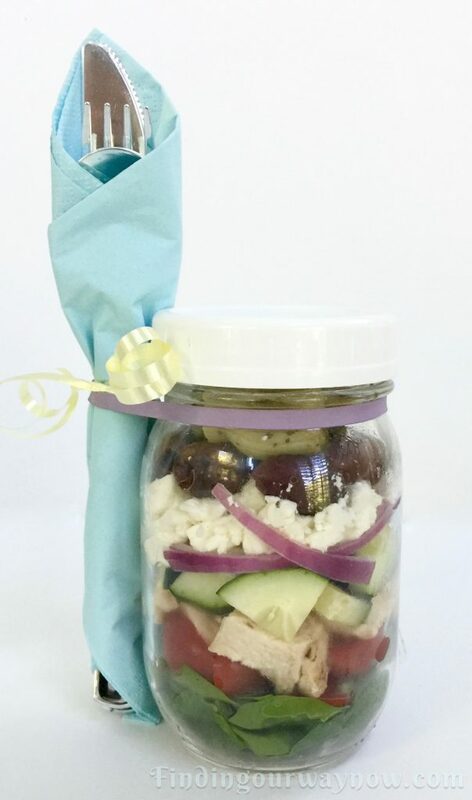 Refrigerate until you’re ready to pack the Greek Salad in a jar for your picnic or to serve. To serve; remove the vinaigrette container. Pour the contents of the jar out into a large bowl or on a plate. Pour the vinaigrette over the contents and dig in. Notes: As you can see this is just a bit of assembly and you’re ready to go. If you’re not into Greek salads, then you can use any combination of ingredients that delights you. Just make sure the ingredients you use will compliment each other. 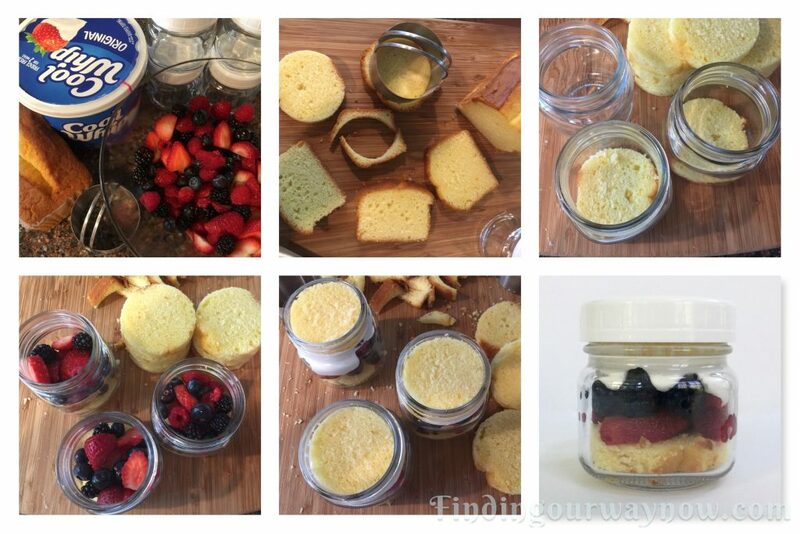 Gently place a round of pound cake in the bottom of the jar. Add a layer of mixed berries. Top with a dollop of whipped topping and put another round of pound cake on top. 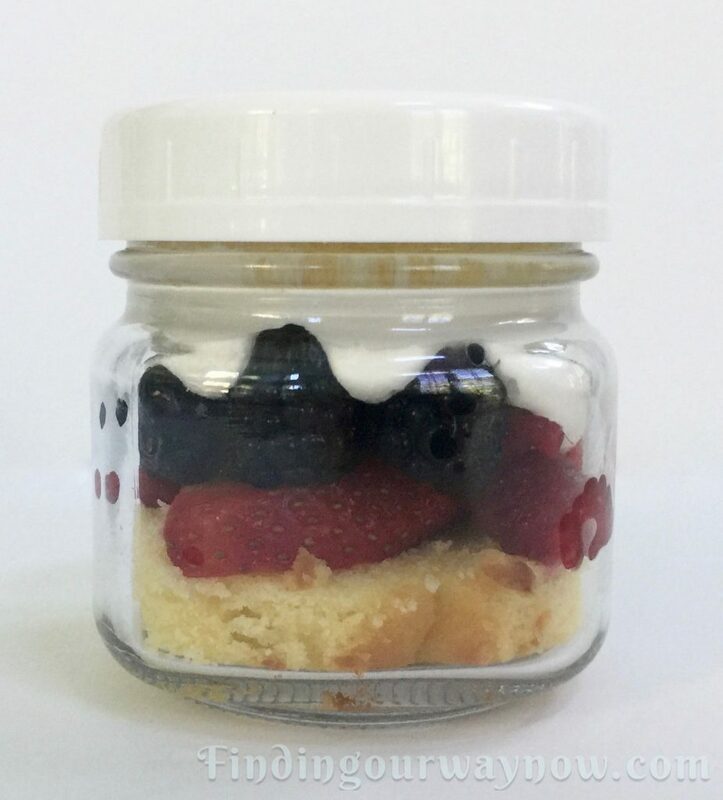 Tighten the lid and refrigerate until you’re ready to pack the shortcakes in a jar for your picnic or to serve. Notes: If you prefer you can use one type of berry or any other kind of stone fruit. There are a ton of things you can do with this recipe. It doesn’t have to be fruit or berries. It could be any type of cake or even use a flavored pudding in place of the fruit. You will have a bit of leftover pound cake and crumbs. Save it for another dessert or make a trifle in a jar for another picnic. Final Note: Why glass jars? Two reasons: they’re reusable and a way better way to store food. 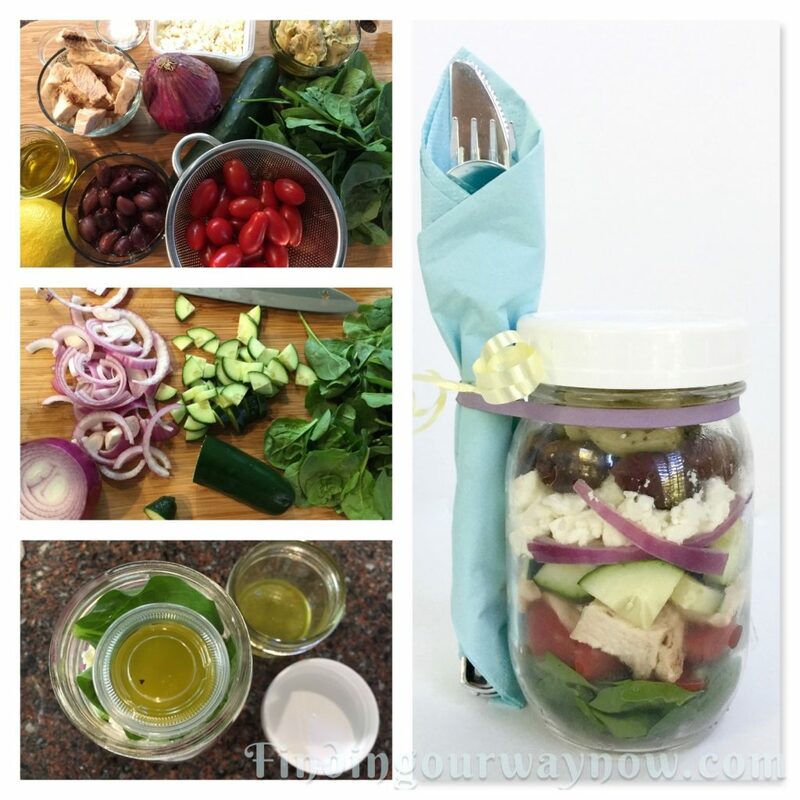 A canning funnel is very helpful when you’re placing the various layers of ingredients in the jars. 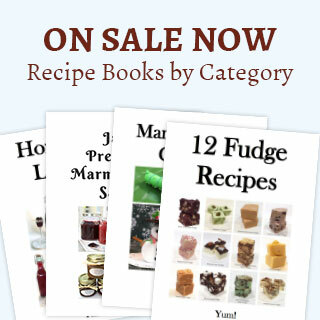 As I mentioned before there are so many ways you can vary each of these recipes. It all gets down to what you like and how creative you want to be. If you give this a try, drop me a note and let me know what you created.